Standard laboratory sample tubes can be used such as ICP autosampler vials. 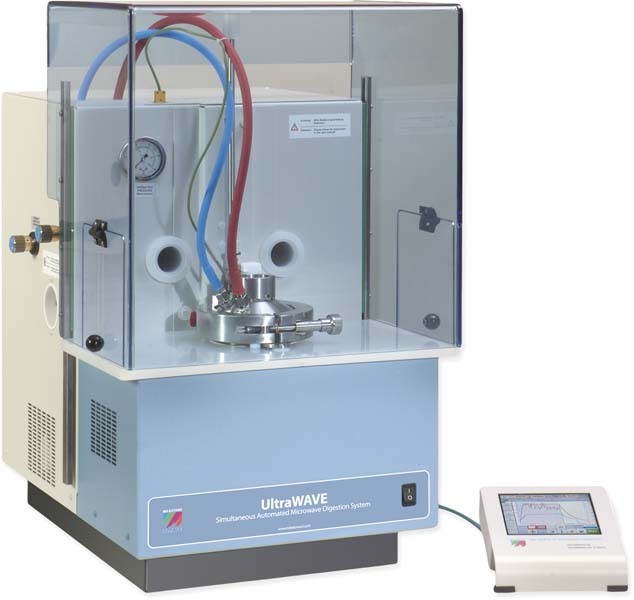 The UltraWAVE is a small unit that fits on any benchtop. The cabinet is all stainless steel and the work area is surrounded by a thick acrylic screen that raises and lowers automatically with the top of the SRC chamber. The screen has side doors that allow the operator access to fasten and release the chamber clamp. Interlocks prevent operation unless the chamber clamp is in position and secured. The chamber is 1 litre capacity, manufactured from solid stainless steel, cooled by a water jacket, and fitted with a PTFE liner. The 1500w microwave power source is located at the base of the chamber, and optimised for even distribution of microwave energy. 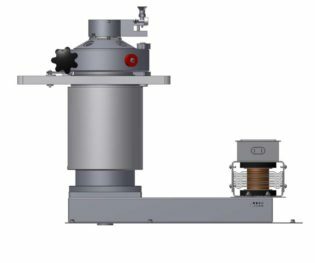 The SRC chamber is fitted with a transducer type direct pressure sensor and a thermocouple type temperature sensor that means that every sample is under direct pressure and temperature control, giving unmatched control of the digestion process. Sample racks are available in several sizes, including the standard 15 position rack that holds 15x15mL vials (glass, quartz or TFM). 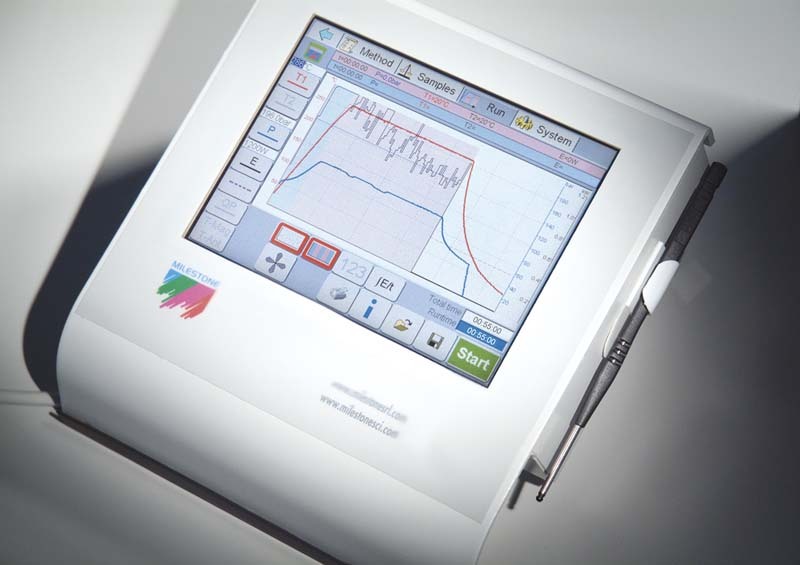 The UltraWAVE is operated via a full-colour touch screen display that provides automatic real-time monitoring and feedback-based control at 20 times per second and adjusts power to match the sample load. The reaction is therefore controlled throughout the run, for example reducing power instantly should an exothermic reaction occur. The same method is used for all samples, all methods and runs are saved. USB and PC card ports are provided for method and data file transfer via memory stick or PC card and Milestone’s EasyDOC Windows-based software enables export of run data to a spreadsheet. SRC operation is extremely simple and completely automated from start to finish. A simple sample rack, similar to a rotary autosampler rack, is loaded with samples weighed into glass vials and the digestion acid added. The vials are capped with loose fitting PTFE caps. The rack is fitted to the chamber top that is lowered automatically into the chamber. The sample vials sit in liquid that provides a consistent “load” for the delivered microwave energy. This ensures even heating and consistent conditions from run to run. The chamber clamp is secured and the chamber pressurised with N2 (40 bar). This prevents boiling of samples as the run starts and essentially acts as a “cover” over the samples, eliminating any possibility of cross contamination. The microwave program starts and all samples are digested under the same conditions. When the heating cycle stops, water cooling rapidly cools the chamber to ambient temperature providing a total run time of 35 minutes.The pressure is released, the chamber is opened and acid fumes are extracted away from the operator. 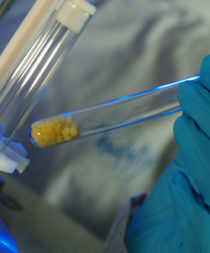 The rack is then simply removed, the samples are made up to volume, and are ready for analysis. Included with the UltraWAVE is a unique web based application – Milestone Connect. 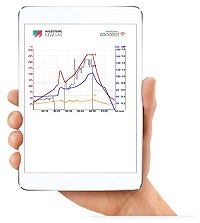 The app provides up to date information and extended instrument monitoring from outside the laboratory of the digestion run that ultimately helps to provide high quality sample preparation. The app works on various external devices such as PC, tablets or smartphones. The integral database includes specific and detailed information on the installed equipment (list of parts, technical notes, user manual, video tutorials, etc), continuously updated application notes, a library of available scientific articles published in scientific magazines, and a help-on-line section that provides instant support available 24 hours a day, 7 days a week.